The vendor landscape of the global market for battery recycling is highly competitive, features a large number of raw material suppliers (used batteries), and is expected to become further competitive as battery manufacturers themselves enter the business through forward integration, observes a recent report by Transparency Market Research. Companies are resorting to the use of advanced technologies for core processes such as smelting and battery sorting and collaborating with niche technology providers. A recent instance would be the February 2016 announcement by Battery Solutions LLC and Call2Recycle, Inc. about partnering to expand their businesses in the sector of sorting used batteries for recycling. Although the market features medium to high entry barriers for new and small companies owing to the requirement of high capital and installation costs for establishing recycling facilities, companies have been able to enter the market with the help of regulatory and financial support from government bodies and environment protection agencies. A number of new companies continue to enter the market, making it further fragmented and competitive. To sustain in such tough terrains, companies will have to focus on implementing innovative technologies capable of cutting costs in areas such as transportation, processing, and recovery of important metals. 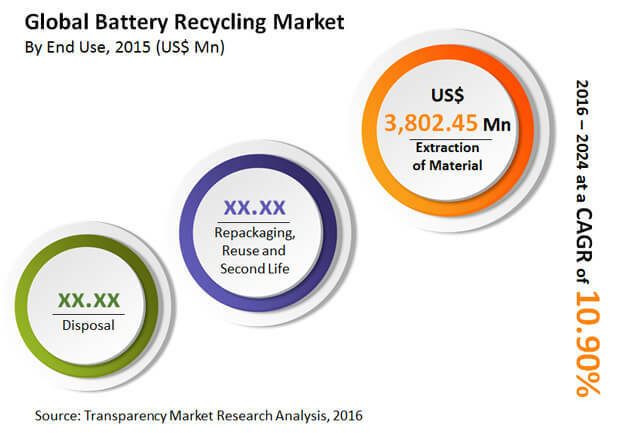 Transparency Market Research estimates that the global battery recycling market will exhibit a string 10.9% CAGR from 2016 to 2024, rising from a valuation of US$7.1 bn in 2015 to US$19.9 bn by 2024. On the basis of battery chemistry, the report covers the global battery recycling market for nickel cadmium, lithium ion, and lead acid batteries. Of these, the segment of lead acid batteries is presently the most recycled variety, accounting for a massive share in the global market in 2015 and is expected to be the most recycled battery type. The business of recycling lead acid batteries across the globe is expected to reach a revenue valuation of US$19.9 by 2024. In terms of geography, the Europe market for battery recycling dominates, followed closely the North America market in 2015. The dominant position of the Europe market in the global battery recycling market is attributable to the stringent emission and environment-protection regulations instigated by most countries in the region. The Europe market for battery recycling is expected to retain dominance in terms of revenue contribution to the global market throughout the forecast period, exhibiting a promising 9.7% CAGR over the report’s forecast period. A number of materials forming the core of most batteries marketed presently contain hazardous materials such as lead, lithium, cadmium, mercury, zinc, manganese, and nickel. Thus, improper disposal of batteries results in vast hazards to the health of living beings and the environment. The rising realization regarding all the potential hazards that negligence on this front could cause and the resultant rise in initiatives by government and environmental agencies to streamline the process of recycling batteries are presently the biggest drivers of the global market for battery recycling. Although the market for battery recycling is gaining a significant boost from the adoption of battery recycling initiatives by automotive and consumer electronics companies through their own recycling centers, low awareness among consumers is presently one of the biggest challenges faced by the market. This factor is projected to impede the growth prospects of the market to a certain extent over the report’s forecast period.